This was not yet my last week serving at the IRMC for the summer, and next week certainly will not be my last. Serving at Indian River Medical Center has honestly been one of my most valuable and gratifying experiences of my life and will always will be. It has provided me with countless friendships and connections, directed me to a more specific career path, built my character, and brought me tremendous fulfillment. Not yet knowing what next week will hold, I have to say that this week was the best week thus far! As I mentioned I would last week, I took advantage of the invitation I received from a surgeons to observe live surgeries. It was absolutely incredible. When I arrived at the hospital in the morning, I went up to the operating room entrance, got changed into scrubs, and immediately began watching an ongoing gastric bypass surgery. There were three probes inserted in the patient's CO2-filled abdomen (CO2 to keep the abdomen inflated for operating within). One site served as the entrance where the camera was inserted to display an enlarged image on the monitors. The other two served as sites where the surgeon entered to operate. All of the incisions were small in these cases. The surgeon sectioned off a portion of the stomach, and connected the other part of the stomach to the small intestine by creating an opening in each and sewing them together. The part of the stomach that was sectioned off will shrivel somewhat, as no food will enter it. As a result, food consumed by the patient will only enter the other part of the stomach and the patient will feel fuller much more easily. I believe that there was also some operation between the small and large intestine that I missed at the beginning, but the main goal of a gastric bypass is to "shrink" the stomach. The surgeon's work there was done. The PA (Physician's Assistant) and several others were left to the tasks of stitching up the exterior incisions, and the anesthesiologist to restore the patient to consciousness. I then followed the same surgeon to a gallbladder removal surgery, mastectomy, and a thyroid removal surgery. The surgeon is a general surgeon, which is why he performs these multiple types of surgeries. Each one was extremely contrasting and fascinating. For the thyroid removal, I also watched the lab specialists create a slide from a section of the thyroid to ultimately identify whether the small mass within the thyroid gland was benign or malignant. The slide-creating process itself was incredible due to the various materials, substances, and methods that were used. The slide then was brought to a man in his office (I did not catch his job title) where he and I viewed the prepared thyroid cross-section through a microscope. The mass turned out to be benign and the man pointed out the microscopic characteristics that led him to make this conclusion. What made this experience so exciting for me was the fact that I saw and felt what it was like to be in these job positions. I have been considering following the track to becoming a PA for some time now, but was bombarded with the innumerable medical career options and opinions of others. 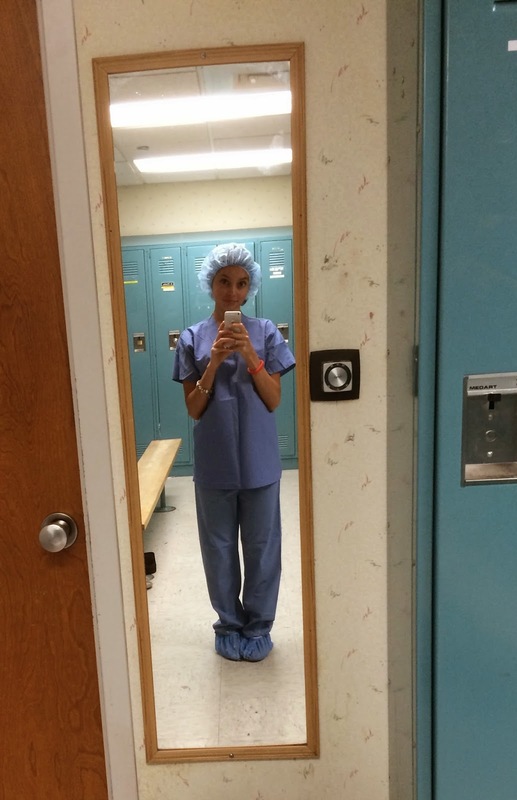 However, more than I have in shadowing or considering any other career, I felt very strongly as though I could be a surgical PA. Career searching has been a complicated and unclear process for me, but gaining the insight that I am from my experiences and conversation is leading me closet to finding what I will set the goal of becoming. And as many people do, I will probably hold several medical positions within my lifetime. Aside from my day of viewing surgeries, I was able to do some more IC work and help in the auxiliary during the week. I am having such a wonderful time in each task that I perform and with all of the staff and volunteers. It has truly been an incredible Summer of Service for so many reasons. I hope that everyone else's summers have been as fulfilling as mine. I'm looking forward to seeing you all soon and continuing the education that I love! P.S. Here's a real picture of me scrubbing up for surgical viewings!